The Omnitronics™ controller is driven by an industrial-grade programmable logic controller (PLC), which provides extreme versatility while remaining intuitively easy to use. Incorporating a full color touch screen the controller enables users to configure set-up of a vast range of important parameters on their Benchtop Pro freeze dryer. The controller’s main screen displays numeric condenser temperature and vacuum pressure values that change color according to the current range. Self-testing functionality allows system performance and vacuum integrity to be evaluated. Data trending shows and records vacuum range, condenser temperature and ambient temperature through a series of colored lines, along with the unit’s current status. Designed for both the occasional user and the freeze drying expert the Benchtop Pro Omnitronics Controller simplifies freeze drying and makes the system easy to operate. One touch start-up and shut down ensure that your product and freeze dryer are protected from inadvertent operational procedures. 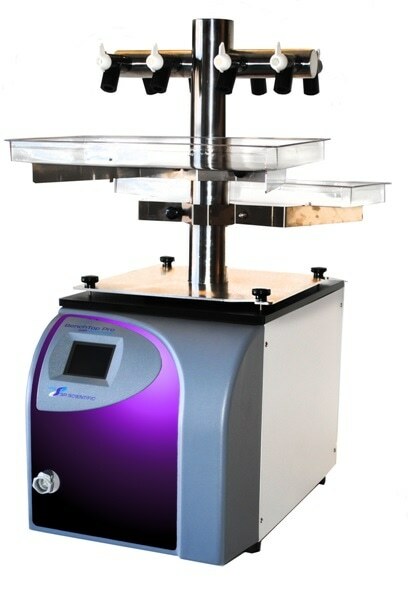 Benchtop Pro freeze dryers are ideal compact research machines that encompass a range of lab processing requirements. They are flexible, powerful and user-friendly. Each system can be configured to meet your present and future needs. Condenser refrigeration packages of -55 °C, -85 °C and -105 °C can meet the demands of both aqueous or aqueous-solvent based formulations. With the Benchtop Pro you can configure your system for smaller sample numbers or to process a relatively heavy workload with condenser size choices of 3 liter, 8 liter or 9 liter. This built-in flexibility allows you to maximize the use of the freeze dryer in your lab while not paying needlessly for unnecessary capacity or refrigeration. Manifolds are available in a variety of easily interchangeable styles. In applications where inorganic solvents are being utilized or you are rack drying and want to ensure visibility an acrylic manifold is the option of choice. For labs tasked with organic solvent applications the stainless steel manifolds will provide a lifetime of use. Traditional time losses incurred from lengthy condenser defrost and clean-up procedures are minimized with an optional hot-gas defrost facility.